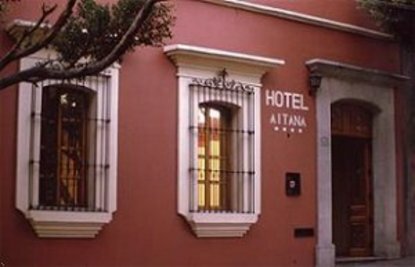 Hotel Aitana is a restored XVIIth Century building arranged around an interior patio with Oaxacan columns and fountains made from the green stone typical of the region. Its charm, personality and cosmopolitan ambiance delight those people who avoid staying in larger, more standardized and impersonal hotels. From the hotels terrace, you can enjoy a panoramic view of the city, which is nestled in a valley and surrounded by the Sierra Madre mountains. Each of its 23 rooms, all gracefully decorated in warm colors, has all modern amenities. The hotel is only a few minutes walk from the magnificent Santo Domingo Convent on the charming walking street, Macedonio Alcala and only a few blocks to the Zscalo, a cheery meeting place for both Oaxacans and international travelers.